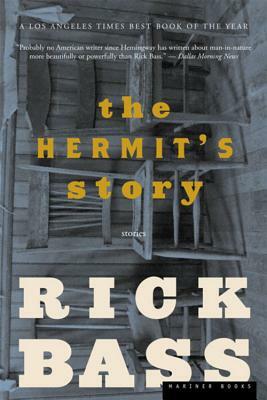 The Hermit’s Story is Rick Bass's best and most varied fiction yet. In the title story, a man and a woman travel across an eerily frozen lake—under the ice. “The Distance” casts a skeptical eye on Thomas Jefferson through the lens of a Montana man’s visit to Monticello. “Eating” begins with an owl being sucked into a canoe and ends with a man eating a town out of house and home, and “The Cave” is a stunning story of a man and woman lost in an abandoned mine. Other stories include “The Fireman,” “Swans,” “The Prisoners,” “Presidents’ Day,” “Real Town,” and “Two Deer.” Some of these stories have appeared in The Best American Short Stories, but for many readers, they won’t even be the best in this collection. Every story in this book is remarkable in its own way, sure to please both new readers and avid fans of Rick Bass’s passionate, unmistakable voice. RICK BASS’s fiction has received O. Henry Awards, numerous Pushcart Prizes, awards from the Texas Institute of Letters, fellowships from the National Endowment for the Arts and the Guggenheim Foundation, and his memoir, Why I Came West, was a finalist for a National Book Critics Circle Award.